No one wants to get infected with ransomware, but sometimes things just happen, and then you need to figure a way out of a complicated situation. If you got infected with Ninja_gaiver@aol.com Ransomware, you have to do everything in your power to terminate the application immediately. Albeit removing it will not solve the file encryption problem, it is still important that you terminate all the potential threats from your computer as soon as possible. If you find it hard to deal with this infection, please leave us a comment and we will guide through the removal process. We will also give you another computer security-related advice, if need be. This program is based on the CrySiS ransomware engine, and so it falls into the same family as Alex.vlasov@aol.com Ransomware, Meldonii@india.com ransomware, Radxlove7@india.com ransomware, and many other programs that we have covered quite a lot on your site. What’s more, for most of the programs in this group, you can apply the same removal instructions. One would think, that it would also mean we can restore the files with the same decryption tool, too. However, there is no public decryption application released as of yet, and so, all the files that have been affected by Ninja_gaiver@aol.com Ransomware cannot be unlocked at the moment. Most of the ransomware applications have a list of extensions they target. This program is not too picky. You can be sure that most of your files will be encrypted once Ninja_gaiver@aol.com Ransomware is done scanning your computer. The program only leaves system files untouched because they are necessary for the computer to function properly. And if your computer cannot function well, you cannot connect to the Internet and send out the ransom email. In other words, if the ransomware were to encrypt your entire data, it would not be able to collect money from the infected users. Ninja_gaiver@aol.com Ransomware uses the RSA-2048 encryption key, which is one of the most complicated encryption algorithms out there. It is virtually impossible to decrypt the files unless you have the original decryption key. Needless to say, the ones who have the key in this situation are the cyber criminals. Does it mean you have to pay the ransom to unlock your files? The decision is up to you, really. Although we would not recommend doing that. The problem is that it is not safe, and no one can assure you that the criminals would not just run away with your money. We would like to point out the fact that the connection between your infection computer and the command and control center may not stable enough. It may work for a while, but then it could go down without any notice. Imagine if it happened after you have sent the money: The criminals would get what they want, and you would not be able to receive the decryption key. That is definitely not the scenario you would want, right? Hence, paying should never be among your options. To tell you the truth, the best way to restore your files would be transferring them back to your PC from an external hard drive. Which means, you should have a data backup somewhere. An external hard disc full of copies of your files is actually a better idea than a cloud storage drive because sometimes ransomware programs encrypt all the mapped drives on the affected system. So, if your cloud storage is mapped as one of your system drives, the files stored in it might be affected by Ninja_gaiver@aol.com Ransomware, too. Also, if you do happen to have a backup, you should copy the files back AFTER you have removed the infection from the system. For that, please refer to the instructions provided below. As you can see, it has many steps, but the manual removal is not as complicated as you might think. Even so, if you are not sure you could accomplish that on your own, you can always rely on a professional computer security tool. Scan your system with an antispyware application of your choice and then delete all the threats automatically. This will save you the time and effort, and your computer will be safeguarded against similar intruders, too. Just do not forget that a lot depends on your safe web browsing skills as well. Press Win+R and enter %WINDIR%. Press OK. Remove the random name .exe file. Delete or change the wallpaper path to another image. Press OK.
Delete the value C:\Users\user\Decryption instructions.jpg. 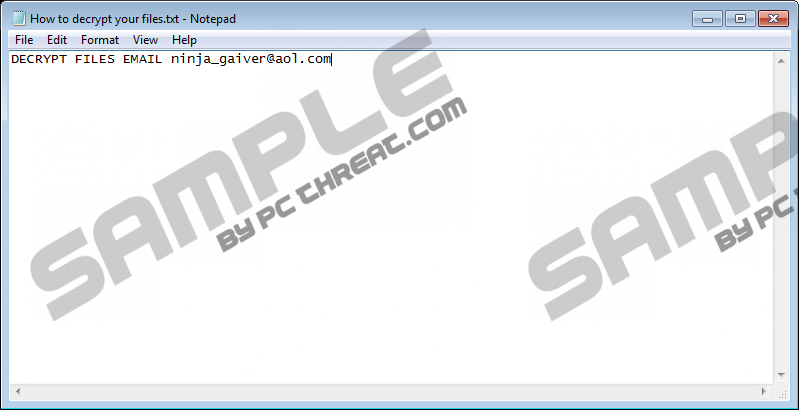 Quick & tested solution for Ninja_gaiver@aol.com Ransomware removal.